The Yomiuri Shimbun, ever ignorant of a newspaper's role being that of a reporter of news, not a creator, is playing anti-matchmaker again in the long-running drama Jiko renritsu seiken with its recurring question, "How long can the Liberal Democratic Party and the New Komeito keep pretending they are not really made for each other?" The link up of the New Komeito and the LDP after years of mutual animosity was one of the miracles of the 1990s, second in its shock value only to the eviscerating (for the Socialist Party) LDP-Socialist Party coalition, which for all time exposed the LDP's raw and bottomless appetite for power. The coalition has been extremely good for both the New Komeito and the LDP, the former for the protection it gives to The Corporation, the latter for the 7~8 million sure votes for LDP candidates in the Diet district and local elections. The loyalty of the New Komeito voters saved the LDP from utter annihilation in the August 2009 House of Representatives election, with approximately one quarter of all votes for LDP district candidates coming from New Komeito voters. The NK really took on the chin in 2009 too: all of its members holding district seats, the party's top leaders, were turned out. However, the temptation for the LDP to dump the New Komeito after nearly two decades of cohabitation seems too strong to resist. With just the remaining members of the Your Party as partners, the LDP would have majorities in the Houses of Representatives and House of Councillors. With all or part of the JRP in a three party cohabitation (what I call the "Hawks-Hawks-Hawks Coalition" as opposed to the current "Hawks and Doves Coalition") the new policy cooperation arrangement would have a gigantic supermajority in the House of Representatives and a solid majority in the House of Councillors. Not the 162 seats Abe needs in the House of Councillors to pass revisions of the Constitution -- but more than enough seats to pass just about anything else tickling the fancy of the PM and his many advisers and hangers-on. Abe and his minister of education Shimamura Hakubun cannot and probably never for a moment forget the New Komeito's spiking of Abe's first attempt to impose a more patriotic regimen and regime upon the nation's schools back in 2007. The New Komeito's rejection and rewriting of the first ever revisions of the 1946 Education Act left a bleeding hole in the side of the first Abe Cabinet -- not the first wound the first Abe Cabinet had inflicted upon it, certainly, but one of the most painful. Ever since that experience Abe has probably been convinced that the coalition with the New Komeito was a marriage of convenience only. 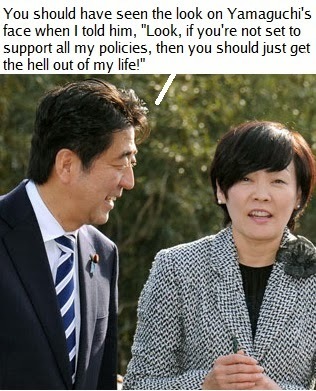 Pretty much everyone with a sense of Abe's mindset probably agrees it is now a highly inconvenient marriage for him. The Yomiuri should nevertheless just stand back and let nature take its course, rather than cheering for the LDP-New Komeito break up. Let us keep this seemly, folks. While were are on the subject of keeping things seemly, Temple University Japan's Institute of Contemporary Asian Studies has uploaded the video of my January 9 talk to its You Tube channel. Please check it out (Link) to see if I indeed follow my own advice. Later - If the above image mystifies, please read Yuka Hayashi's interview. Michael, next time please ask Robert to arrange it so we can see your slides in the youtube version of your Temple U talk. Editing the video so as to go back and forth between the speech and the slides is probably outside the bounds of the ICAS program. Considering the appellation you would tive to a coalition of the LDP, Your Party, and JRP, I suggest the three move their headquarters to 三鷹 (Mitaka) in the Tokyo metropolitan area. They even have anime production studios there to realize all the fantastical ideas Mssrs. Abe and Aso have.